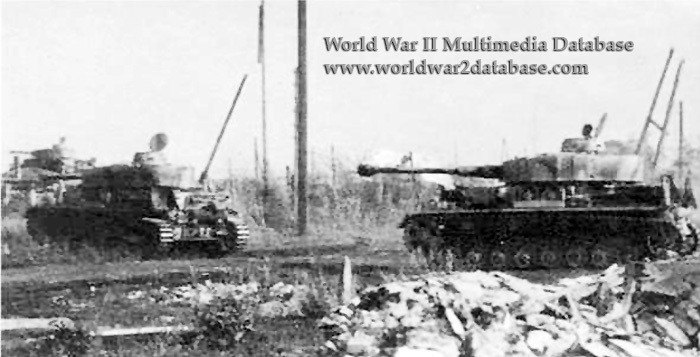 Late model Panzerkampfwagen IV ausf G tanks on the move. The ausf G was the first version of the venerable Panzer IV to carry the long-barreled 75-millimeter gun, which allowed the workhorse of the panzer legions to defeat the armor of the Soviet T-34. At first designated the ausf F2 in March 1942, and then redesignated Ausf G in May. When the British encountered the ausf G in North Africa, they nicknamed it the "Mark IV Special", since it was superior to any American or British tank at the time. The installation of the new gun increased the overall weight of the tank and reduced its speed. 1475 Ausf G were produced by Krupp-Gruson, Vomag and Nibelungenwerke. Both the F2 and G variants were designated Sd.Kfz.161/1. The F2 and early G models had a two-piece turret hatch access to the commander's cupola; later models, like the ones shown, had a single piece hatch. After March 1943, an additional 412 Ausf Gs were produced armed with a newer 75mm gun; designated Sd.Kfz.161/2. Ausf G featured new simplified design turret mounted with smoke grenade launchers.